Baking is one of my favorite part of the holiday season. Whether I am making home made chocolates, pies or cookies, the holidays mean you will find me in the kitchen more often than usual. I put together several tips for healthier holiday baking that really do work – without tasting any less delicious than the less-healthy variety. This way you could indulge and not worry about how much fat, calories and sugar were in each bite. 1. Butter/Oil – Try replacing half (yes half) of the butter in cookies, or half of the oil in cakes, with apple sauce. The substitution will maintain the moisture and provide natural sweetness. Bonus: it’s even better if you can make your own apple sauce. Don’t add any sugar or extra flavors to your apple sauce – reserve that for your baking. 2. Sugar – Coconut sugar, sugar cane and even honey can be used to replace white refined sugar in most recipes. Even with the substitution, try cutting the sugar in half. Coconut sugar can be found in natural food stores in a powdered form which will easily replace sugar in any recipe. Honey, on the other hand, will make your baked goods denser, and is naturally much sweeter than refined sugar, so a small amount goes a long way. If you are used to eating very sweet desserts, it may taste a little strange at first to cut the sugar, so take it in steps. 3. Eggs – Eggs act as a combining agent, but they are heavy and high in cholesterol. Try using only the egg-whites. Egg-whites can be bought on their own in cartons, so you don’t have to waste the yolk. Another suggestion, a personal favourite of mine, is to replace the egg with a water and ground flax seed mixture (three tablespoons water, 1 tablespoon flax seed, and let sit to thicken). Usually, this mixture will replace one egg. The same substitution will work with chia seeds. 4. Flour – The gluten from flour can leave us feeling bloated, especially after a meal. So try experimenting with gluten-free flours such as buckwheat, brown rice, quinoa, etc. You can replace up to half of the required flour with gluten-free flour in muffins, cookies, waffles, Bundt cakes, etc. 5. Chocolate – Chocolate chip cookies are a classic, but store bought chocolate chips add extra sugar, fat and calories. To cut the sugar, try using dark chocolate chips, or replace them altogether (I know this is hard sometimes) with raisins, dried cranberries, nuts or fresh fruit. These tips can be applied to almost any baking recipe. 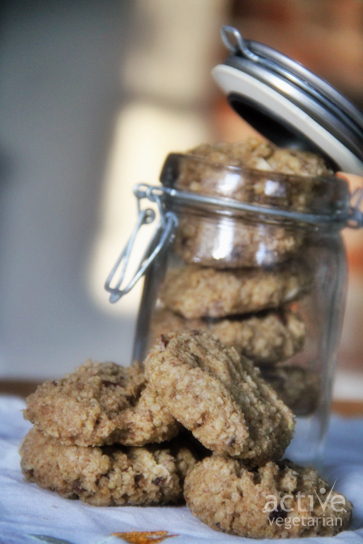 I am constantly experimenting with my own recipes – a batch of my cookies never come out the same way twice. Let yourself be creative, enjoy! PS. Stay tuned for our AV Holiday baking recipes.